Today, I’d like to share with you a charm friendly table topper that you can make quickly but with stunning results! Yummy! I just love these colors. In my pattern stash, I had a great pattern by Jaybird quilts called Rock Candy. This is a fun table topper pattern that you make using her side kick ruler and a charm pack plus background fabric. 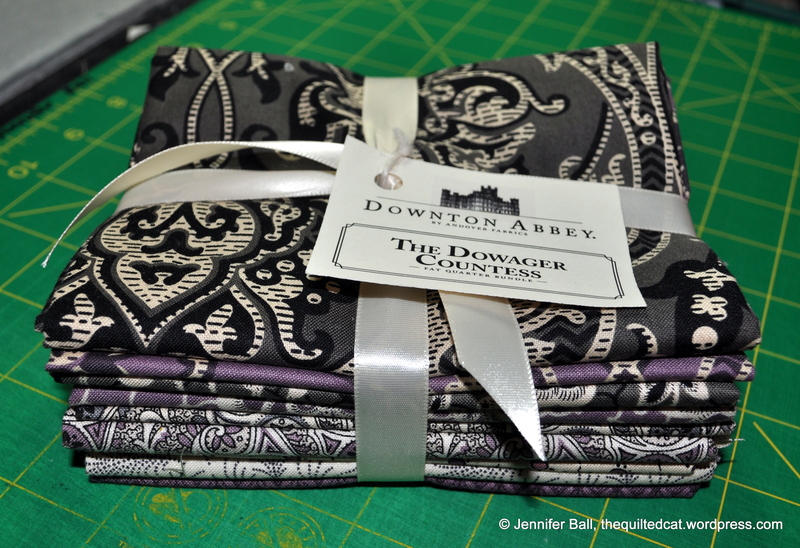 I used my Downton Abbey fat quarter stack and a white-on-white print for the background that I had in my stash. I took another picture indoors on my coffee table so you can get a feel for the size of the table topper. On the top of the quilt sits a handmade wooden bowl that my grandfather made for me. He was a master craftsman who passed away last fall so I really treasure this bowl. I did all the quilting on my domestic Bernina. 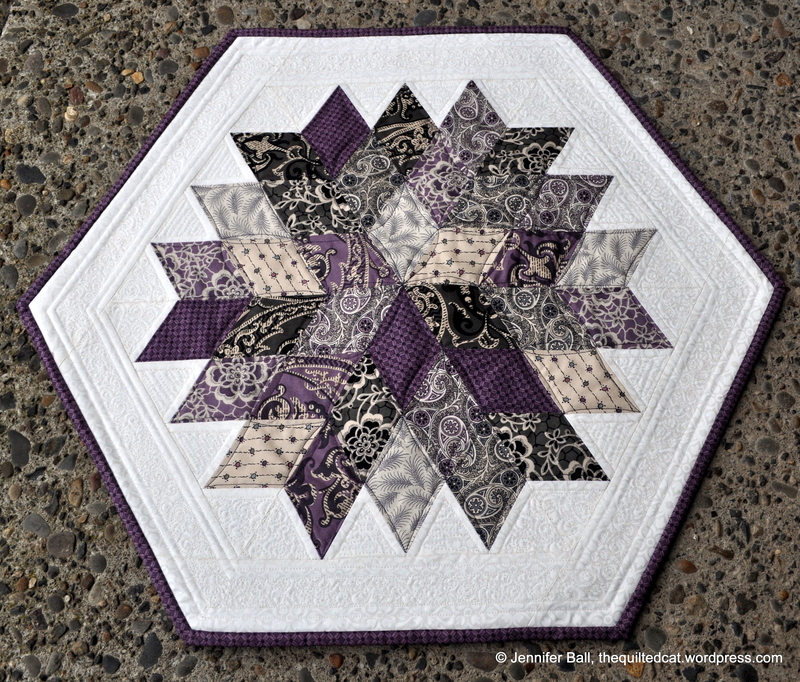 For the colored diamond shapes, I echoed quilted a slightly curved diamond shape with purple Aurifil thread. I did more involved stitching on the white background sections using Superior Threads So Fine #50 in pearl. I straight-line echo quilted around each of the patterned fabric points. I then filled in each white triangle shape with a curvy, snake-like pattern and each white diamond shape with swirls. Next, I did 2 rows of straight-line stitching in the white border, followed by a 3/4-inch section of swirls, and followed by 2 more rows of straight-line stitching. In person, the stitching really adds some nice dimension and texture! Don’t forget to visit the Wake Up to Kona blog hop going on now! My day to display my project is Monday, January 20th. This entry was posted in Charm Pack Table Runner, Modern, Quilts and tagged #RockCandyQuilt, #sidekickruler, Andover, Downton Abbey, free-motion quilting, Jaybird Quilts, Rock Candy, sidekick ruler, Superior Threads So Fine, table topper by thequiltedcat. Bookmark the permalink. Hope you see this post….I realize your table topper post is almost a year old! I LOVE your topper! Can you tell me if this pattern is doable without the specialty ruler? Thank you! You can use Julie’s Sidekick ruler for this table topper or make a template using the guide in the pattern. What gorgeous and intricate quilting! Simply beautiful. Oh, your table topper is just beautiful! Love your fabric choices and quilting!! I just saw that ruler demonstrated at the Pine Needle’s open house. How fun to see that pattern again in the Countess Colors!